Boscombe Community Fair 2007 – Creative Dynamo Ecotainment! One week after Boscombe Community Fair and I’m finally getting back to normal. I’m even moving into a house tomorrow as I’ve been on-the-road all summer. The community fair is a great little event that tops off the summer for me every year. This year I managed with a lot of help to set-up the wind turbine for the first time. Even though there was hardly any wind it was up 3 days early and inspired loads of people to enquire about using our electricity. Throughout the whole festival we were providing green power to the healing area, kids area and the agoraphobic pirate arena. On top of that Boscombe community fair want us to provide more energy next year – success. Friday night I DJ’d as Dirty Ali in the arts tent enchanted forest party. There was a disco dancing contest and I gave away 3 classic disco tracks on vinyl to the winners (congrats to you all). I had been trying to decide all week whether or not to use some of the already supplied equipment or stick with my recycling / reused principles. In the end I had to use a mixture of both as the PA supplied did not even have a turntable! On the other hand my 40 watt amp would’ve been drowned out by another stage which was over 200m away. The show lasted about 2 ½ hours and was recorded so I will get down to some editing and uploading soon. There are still two more Big Green Breakfast shows on tape and a few other recordings from gigs in between. The studio is developing slowly but should get going very soon. Hopefully I can catch-up with all this stuff now that the summer’s coming to a close. By far the most fun I had at the community fair was using my system as a PA to host the children’s rocket launches in the arena on Saturday afternoon. The rockets were made from recycled materials and really blasted-off landing all over the place. Saturday night was an impromptu gig with an MC called Pat. This gig was quite impressive as we managed to get a whole host of kids to stop by and join in with surprisingly good mc’ing and beat boxing from people we’ve never met before. We also managed to link-up another set of speakers by using another 80’s Panasonic ghetto blaster and FM transmitter. I got a real pirate buzz (even now writing about it) doing this gig and announcing we are live on 107.5. BIG shout out to you Pat and the other MC’s / dancers who were there. Kids were also connecting with the music in ways I never imagined. I have a record ‘ring my bell’ which appears on the video game san andreas. On Friday night a kid dancing on stage aged about 7 came up to me and told me that. I played it again on Saturday and got a similar response. In fact the kids on the mic got so hyped up whilst it was on my 150 watt inverter cut out as they blasted the mic. This gave me the chance to play the record from the start with a shout out to the ‘san andreas crew’. Midday Saturday was a tiny tots disco in the kids area using my gear with friend Sam’s laptop. It was a lot of fun for us grown-ups but the kids seemed less impressed. Especially as some nut that used to ‘sleep in a toilet’ showed up and quite frankly began to bother us all. At 3pm in the arena I was supposed to play a CD for Capoeira dancers using my system. Unfortunately for them and me the only part of the system that didn’t perform was digital (the CD player) and there was a 15 min delay whilst we sorted-out Sams laptop again. At 4pm I got the whole system up and running for the minutes NOISE rememberance – this involved the whole festival making as much noise as possible for 60 seconds and was wicked.Photos and recordings will be appearing soon – please get in touch if you are at all interested or were at the gigs and upload your own photo’s etc. 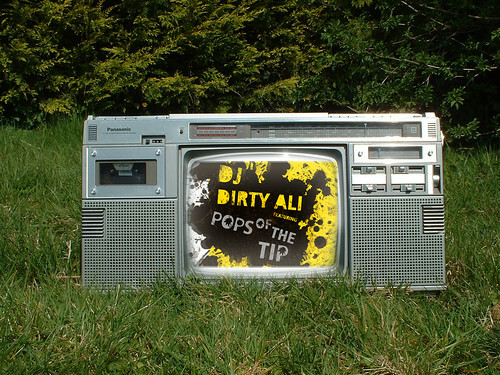 You can let me know by using the tags tip of the pops – dirty ali disco – bcf or bcfuk and I will find them. Alternatively you can contact me by emailing infoATcreativedynamoDOTnet. Finally MASSIVE MAGIC thank you to John who I first met at the Big Green and then came to Boscombe fair. Without Johns solar panels or support the green energy would not have been a success at all as I was constantly to’ing and fro’ing between work and festival PLUS there was hardly any wind for the turbine!